boson (which then decays tae electron an antineutrino) isna shawn. 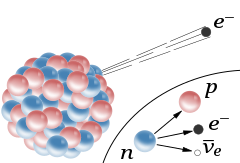 In nuclear pheesics, beta decay (β-decay) is a teep o radioactive decay in which a beta ray (an energetic electron or positron) an an associatit antineutrino or neutrino are emittit frae an atomic nucleus. This page wis last eeditit on 13 Februar 2018, at 21:59.